Franciscan roots: Bubba Tou, Kasey Seawright, Damian Lam Sam, Kaitlyn Lake, Joshua Francillon and Shiv Singh with the head of campus Mark Fogarty. MARK Fogarty believes St Francis of Assisi is the perfect saint to guide the Catholic community in Crestmead. The head of St Francis College Crestmead’s secondary campus, who is retiring on June 27, has spent almost 25 years trying to understand their saintly patron better. “You could have had all sorts of saints as your guiding light, but Francis is probably the best you can have,” Mr Fogarty said. “St Francis was not only patron of environment, but his mission was about those outside the walls of the city. “In his days, inside the walls, you were healthy with enough food. “Everybody else, including the lepers, were outside the walls, and that’s where his mission was. “We’ve been a school outside the walls doing the work within the lineage of St Francis of Assisi. “We’re in Logan city, and it’s a socioeconomically disadvantaged area, it’s where the refugees come, those without great finances. “I always see Logan City outside the walls of Brisbane. Mr Fogarty said the school’s Franciscan tradition had become an important part of his work with students, staff and the wider Crestmead and Logan community. “I came here in 1989 first as deputy principal, and after two or three years I realised that I had to understand this guy because clearly he’s right for this place,” Mr Fogarty said. Part of his research included two trips to Assisi and plenty of reading to understand his approach to mission, which he said was to be with those “outside the walls”. A quick walk around reveals the school’s Franciscan foundation with its Franciscan iconography, and a small natural hermitage down the back of the school. But the tradition goes deeper with the school’s Community Centre that offers a baby care clinic, a playgroup for two to five-year-old children, and before and after school care. 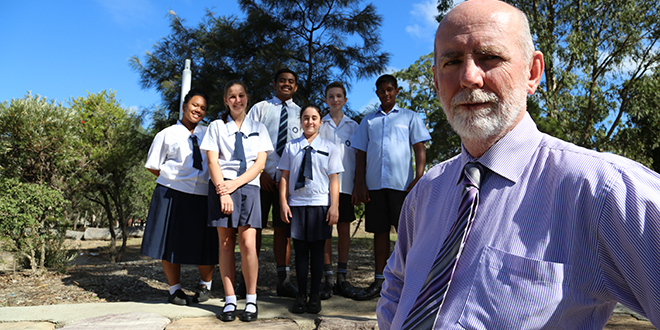 “We are in a disadvantaged area, so I’ve always believed a simple P to 12 school that just deals with academic stuff is not quite what this community needs,” Mr Fogarty said. “We’ve worked on issues broader than academic learning in the classroom.